Hustle Boss was on hand during the fights and here are some highlights below. 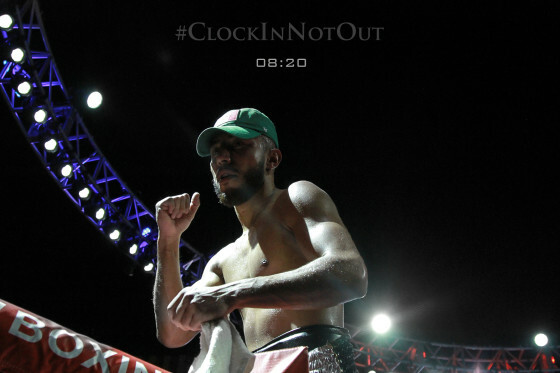 We teamed up with local photographer 1Tarrell of #ClockInNotOut for this particular show. 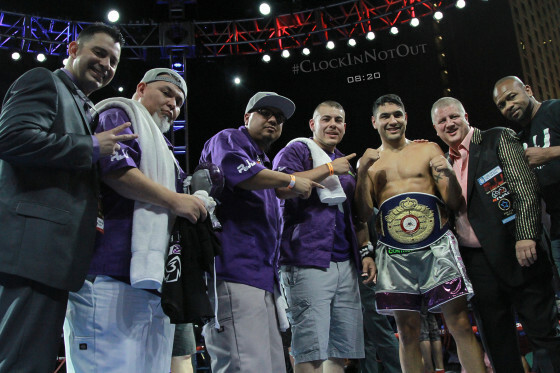 Las Vegas trainer Gil Martinez appears to be reaching a nice pinnacle with his career. Martinez is known very well in the Vegas area due to his work with a wide range of characters in the boxing and MMA field. 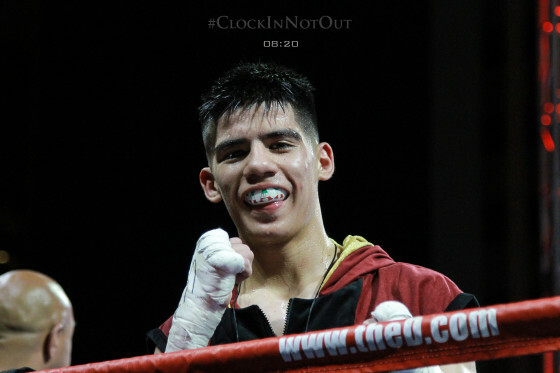 On Saturday, two of Martinez’s pupils, bantamweight prospect Max Ornelas and junior lightweight prospect Randy Moreno, both secured victories. 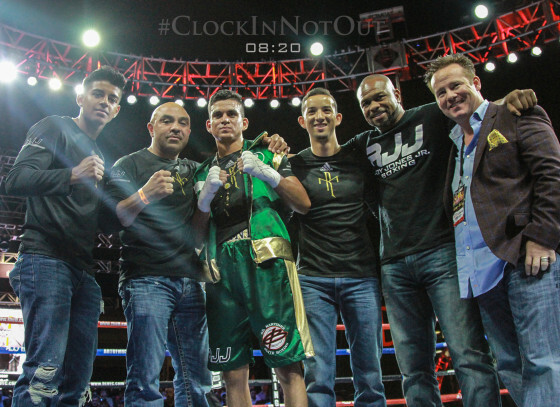 I remember first seing Ornelas in action in December of last year inside of Richard Steele’s gym in Vegas when he was still an amateur. 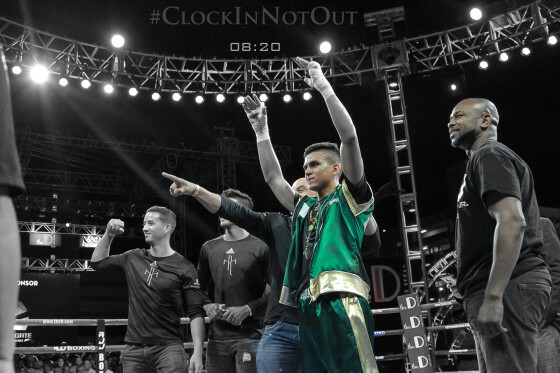 Now 5-0 as a pro with two knockouts, Ornelas grabbed another victory this past weekend by winning a decision over tough Mulapi Enjani. 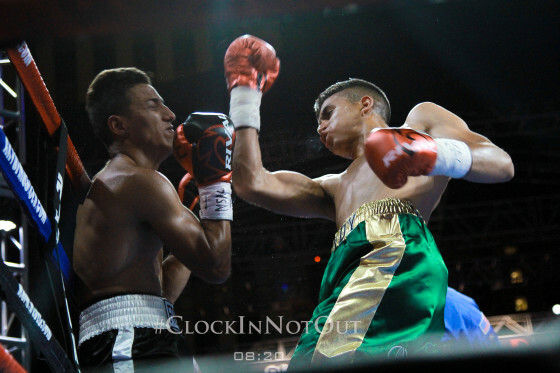 Ornelas, just 18 years old still, showed excellent poise in out-boxing his rugged foe over four rounds. 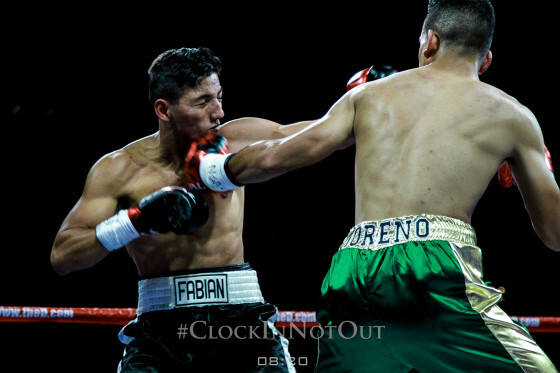 A few bouts later and it was Moreno’s turn, as the 20-year old simply overwhelmed his opponent, Fabian Alaniz, for a second-round TKO victory. Moreno was too powerful and accurate, and the end was never in doubt. 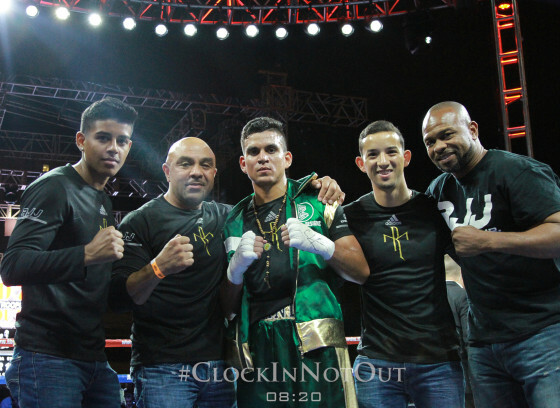 Moreno (5-0, 4 KO’s) has been training with Martinez since he was just eight years old and his name will continue to make noise in the coming years. In one of the evening’s co-features, Fort Worth, Tex. 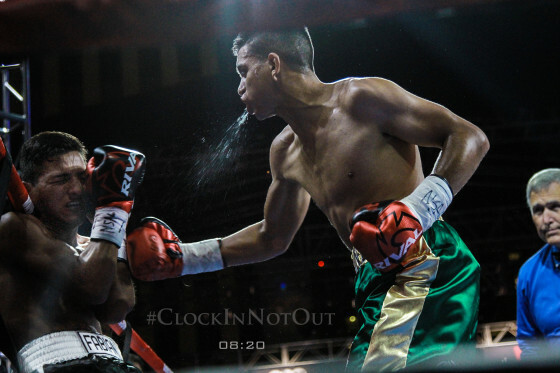 native John Vera stopped Montenegro’s Milorad “Micko” Zizic in two rounds. A rangy southpaw with some definite pop, Vera (15-0, 10 KO’s) had success countering an onrushing Zizic (12-2, 6 KO’s) from the opening frame. 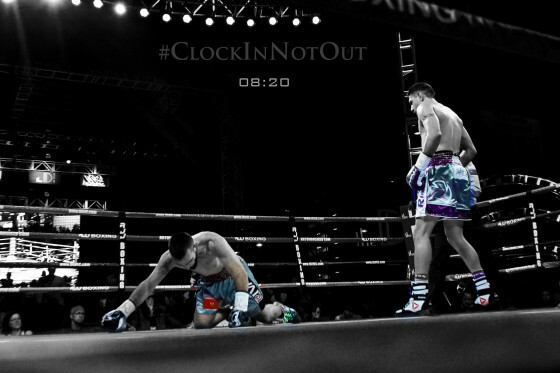 A pair of knockdowns were registered in the second round, with referee Kenny Bayless waiving the match off at the 2:15 mark. 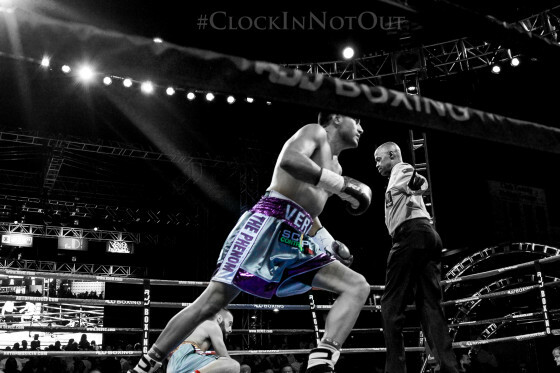 Vera’s frame and counter-punching ability from his southpaw stance make him an interesting player at 154 pounds. Zizic is a fixture in the Vegas area and trains out of the Mayweather Boxing Club, yet he didn’t appear to be himself on Saturday night. 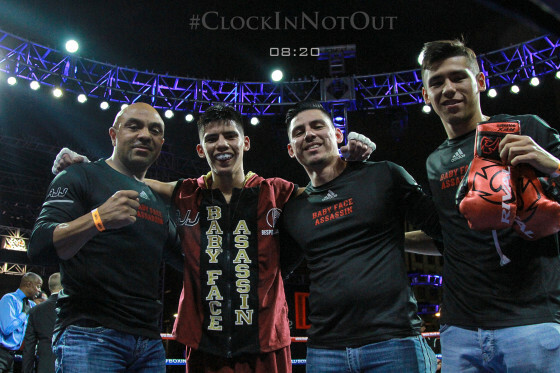 In another co-feature, St. Louis’ Stephon “Showstopper” Young found himself locked into a tight battle with Dallas’ Juan Antonio Lopez in a bantamweight attraction. 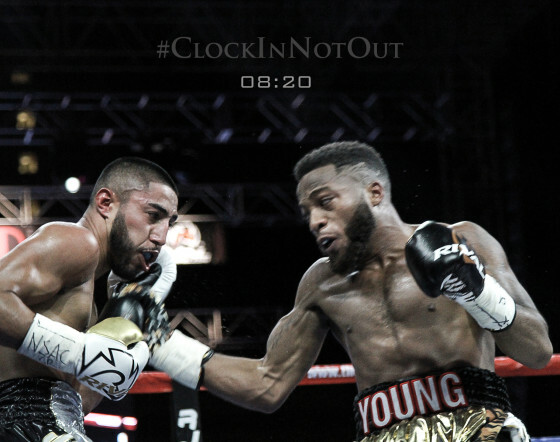 Young (15-0-3, 6 KO’s) had some trouble adjusting to the southpaw style of Lopez (11-2, 4 KO’s) in the early rounds and you could sense that it was going to be a long night for both guys. Several exchanges took place in closed quarters and Young began to up his work rate in the late frames. After 10 rounds, scorecards reading 97-93, 96-94, and 95-95 saw Young come away with the victory as well as the WBA-NABA bantamweight title. On the undercard, Las Vegas local, by way of Long Beach, Calif., Jeremy “J Flash” Nichols improved to 7-0 with two knockouts after winning a clear decision over Marquis Hawthorne (4-5, 1 KO). A welterweight prospect with high ambitions, Nichols had no trouble having success whenever he let his hands go. Nichols can often be seen switching from orthodox to southpaw during his matches and he was a little sharp and prcise for Hawthorne. 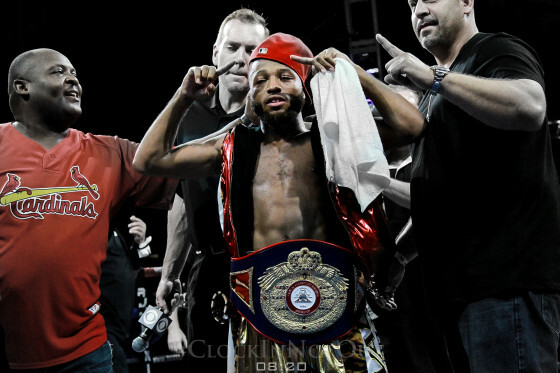 Nichols is a fan favorite and trains out of the famed Johnny Tocco’s Ringside Gym in Vegas. Check below for a highlight of Nichols’ victory.